Anugama was born in Cologne, Germany. As a young man, he worked in a music shop in Hamburg. Surrounded by all kinds of musical instruments, he was free to experiment. A strong pull led him to travel extensively in his twenties, which expanded the variety of instruments and musical styles available to him. Anugama developed an interest in spiritual philosophies and meditation, which led him to Asia. The years he spent there proved to be a time of profound transformation. Inspired by many different cultures and a skillful multi-instrumentalist, Anugama loves to create all kinds of music; his vast repetoire ranges from the zesty beats of African and Caribbean sounds to the flowing rhythms of Hawaii and the meditative spirit of India and Japan. 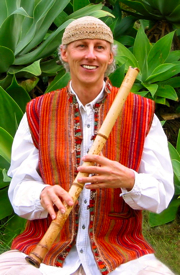 Fascinated by the way in which different frequencies affect our whole being, he has become well recognized for his achievements in shamanic and healing music. His intention, through all of his music, is to support a healing of the spirit and a greater universal harmony. Now, residing on the island of Maui, Hawaii, he receives great inspiration from the intensely beautiful surroundings. What radiates through his music is a joyous love of life and a deep sense of peace. To this end, he continues to create and share his love of music with us. Anugama's music is slow, gentle, and beautiful, conveying a feeling of ease and comfort and a profound sense of inner peace. Expertly played bamboo flute is layered over relaxed percussion grooves, drones, and subliminal chants. Anugama's Environment CDs blend natural sounds with simple instrumentation. Shamanic Dream by Anugama is especially suitable for trance meditations. A heartbeat drum accompanies the continued low repetition of the mantra "So Be It". The second part is a journey through and meditation on the chakras, the energy centres of the human body. This peaceful relaxation-trance music flows with a gentle shamanic spirit inviting us into the heart of being. Prayerful flute melodies, relaxed heartbeat drumming and chants are leading us on a magical journey. Shamanic Dream II is part of Anugama's Spiritual Environments Series. Spiritual Environments recordings use music in combination with neuro-acoustic methods to induce deep relaxation and enhance healing.